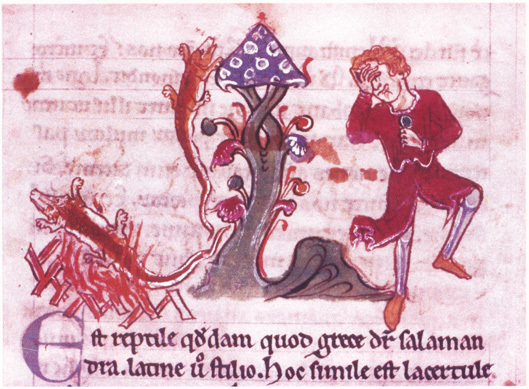 The symbol for Fire was more often than not the salamander, sometimes with six legs, sometimes with only four. As the Salamander lives in the Fire so does the Stone. 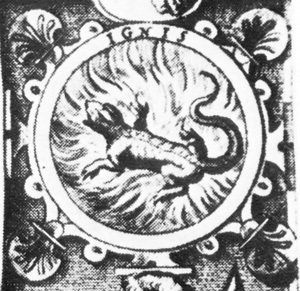 The hieroglyph of Fire, the Salamander is the symbol, at once, of Sulphur and of the Secret Fire. The Secret Fire, hidden under a saline aspect, is indispensible so that the prepared Matter, or Subject of the Philosophers, may fulfill its calling as a mother. 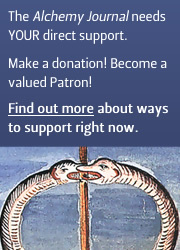 Each form of generation seeks the aid of the proper agent. As animals are born of a fecundated egg, and vegetables from a seed that has been made prolific, so minerals and metals have their origin in a Seed, a metallic liquor, fertilised by the mineral Fire. The spiritual Secret Fire, corporified as a Salt, is the hidden Sulphur which, as Maier points out, is the Philosophick Tincture, and which fixes all flying Spirits. The salamander or fire newt bathing in the flames. 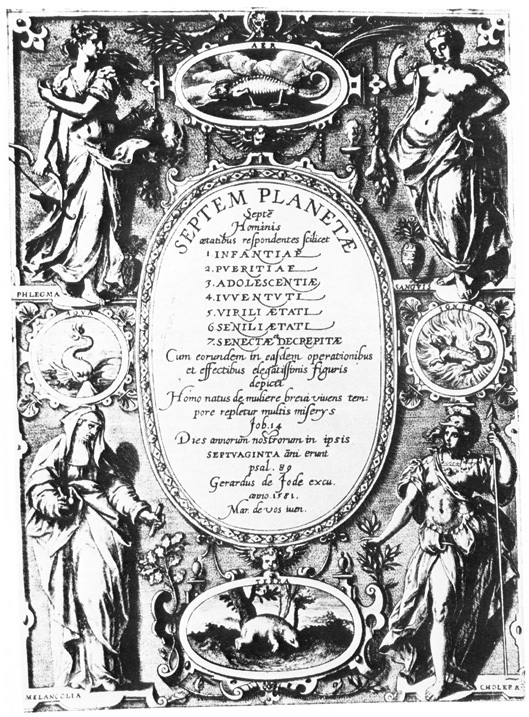 Detail from a plate in Lambsprinck’s De Lapide Philosophico (1695 edition). A salamander lives in the fire, which imparts to it a most glorious hue. This is the reiteration, gradation, and amelioration of the Tincture, or Philosopher’s Stone; and the whole is called its Augmentation. Which Nature herself has assigned to it. In all these the Salamander washes, and is purified. So that it dies, and yields up its life with its blood. And then death has no more power over it. The same has not its like in the world. Of men, and of beasts. Possessing the power of the whole world. That we may remember them for ever. 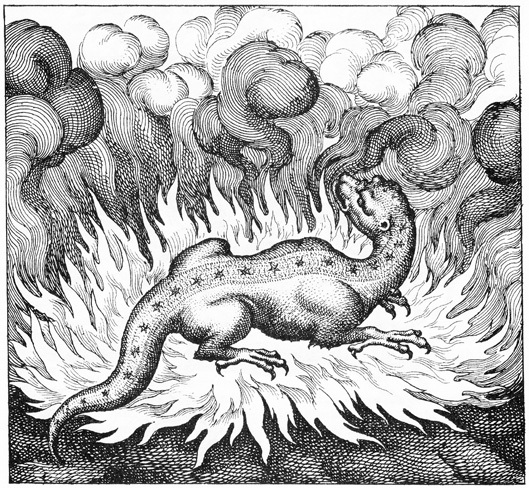 The Salamander, which, according to fables, lives in the fire, is the perfect symbol of Sulphur, Fire, Spirit or Light. The Blood of Fire is the Quintessence, which cures all ills in the three Realms. The occult world is the hidden world. But what is it hidden from? Well, the occultists themselves usually insist that the world with which they themselves are familiar is hidden from ordinary vision. Most occultists will say that, while it is quite possible for anyone to see this hidden realm, special preparation is usually needed. The majority of people are quite content to pass their lives immersed in the ordinary world of time and space, oblivious to the fact that it is a world interpenetrated by other worlds in which there is a different time and a different space. The whole range of occult symbols which have come down to us from the remote past is concerned with giving us information about the nature of this different time and space which is hidden from ordinary sight. How is it possible for a hidden world, or an invisible realm, to be represented in ordinary pictures? Imagine, for example, something we have already mentioned, such as the flames which are used to denote the spiritual realm. When an ordinary person looks at a fire, he sees flames leaping upwards. He probably knows that the flames are fed by oxygen from the air, and that what he is seeing is an incandescent gas. Now, when an occultist or an initiate looks with especially sensitised eyes towards the flames of a fire, he does not see only incandescent gases. He sees a sort of life force which is directly linked with the power of the Sun; he also sees that the fire is animated (like all earthly things) by a special soul-being. Such a soul-being is called by modern occultists a ‘salamander’. Salamanders are famous in occult circles for their volatility: they change their shape with extraordinary rapidity and love flames. Indeed, without flames they cannot live, just as humans cannot live without air. 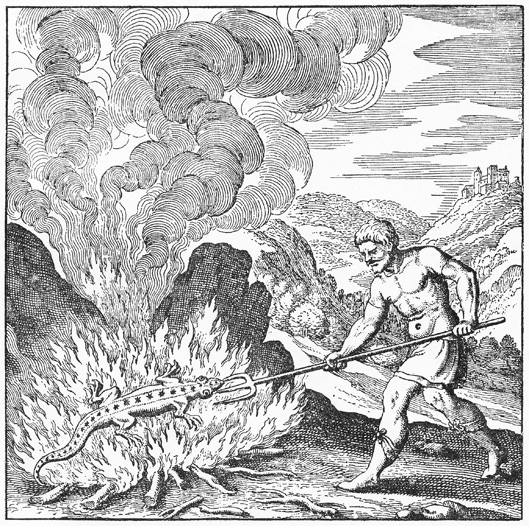 There are many occult drawings of salamanders luxuriating in the flames of the fire. When an artist wants to paint the flames of fire, he realises that he cannot paint the movement. He has to adopt a convention to render the fire as though it were still, even though he knows full well that the important thing about a fire is that it is in constant movement and that it is hot. The two most important things about the fire – its movement and its heat – the artists cannot represent on paper. For this reason we accept the convention that the many tongues of flame … represent fire. So it is when an occultist seeks to represent the nature of the salamander which he sees dwelling in the flames. He knows that the most important thing about the salamander is its life, its joy, its exuberant movement and its love of warmth. None of these things can he represent on paper, of course, and so he is reduced to representing this extraordinary creature as a newt, or tiny dragon, bathed in flames. It was quite usual for the alchemists to symbolise fire with the simple drawing of a triangle Δ. This symbol indicates that the fire principles strives upwards, as though to the spiritual realm. The broad base of the triangle also indicates that the creative force of fire is well founded or stable, resting firmly and securely on the earth. Naturally, the representation of fire in its many forms is complex and not limited to the upwards-pointing triangle popularly recognised in contemporary (i.e. modern) alchemical texts. Fire in all its attributes warrants a more detailed examination; this shall be undertaken via forthcoming posts. There will be more on our beloved fire newt too.